"This is an incredibly sane approach to the 'drug problem,' and, since the author went through a very conventional medical school, one wonders how he came by his wisdom. Somehow his deep understanding of the dynamics and principles of consciousness enables him to look at this problem from a very new and refreshing point of view --ending, as I do, with the feeling that when you get the message you hang up the phone. Psychedelic drugs are a temporary catalyst which, when properly used, lead on to sompler ways of meditative contemplation." "His intuitive speculations are ... continually fascinating ... one leaves it convinced that the author has touched on numerous insights that should be explored more meticulously." 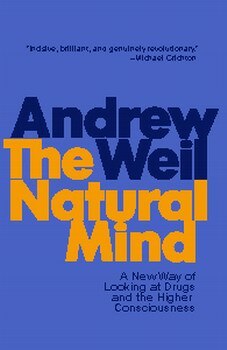 "A drug book so original and carefully worked out must be a rarity. Whether or not it sparks a cult in the counterculture...almost everyone interested in the subject should be able to profit from it." "Readers who are willing to put aside preconceived notions and come to The Natural Mind with an open mind will find it a remarkably rational exploration of a subject which is all too often submerged in irrationality."